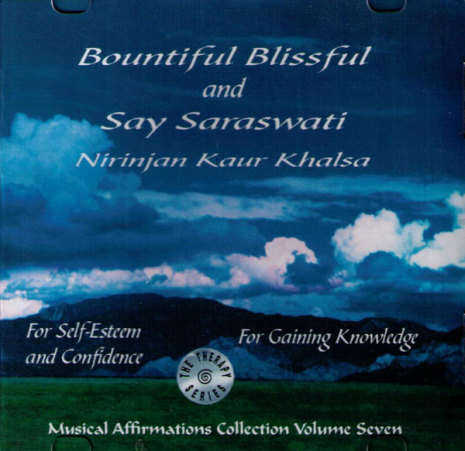 Bountiful Blissful is a powerful affirmation that starts with "I am bountiful, blissful and beautiful. Bountiful blissful and beautiful I am." This is followed by a mantra which translated means: "There is one Creator of the Creation, this is realized through the True Light. Oh my mother I am in ecstasy, for I have found the True Light with ease, and within my mind resounds the music of bliss. With the music of jewels and crystals, the celestial fairies hymn the Word, whom they enshrine in their mind. I am in ecstasy, for I have found the True Light." Interwoven with this song is the chant Ek Ongkar Sat Gurprasad. Say Saraswati has lyrics and music for gaining knowledge. It calls on the Shakti or the powerful female energies in the universe invoking happiness, victory, prosperity and fulfillment.